The next “Coffee With a Cop” will be held on Tuesday, August 14th, from 9:00 a.m. – 10:00 a.m. at Bee Coffee Roasters. They are located 5510 Lafayette Road (south end of the strip mall – south of 56th Street). Stop by, enjoy this local coffee shop, and get to know our officers and Commander Lewis better. It is a terrific opportunity to ask questions and talk to those who protect us every day. 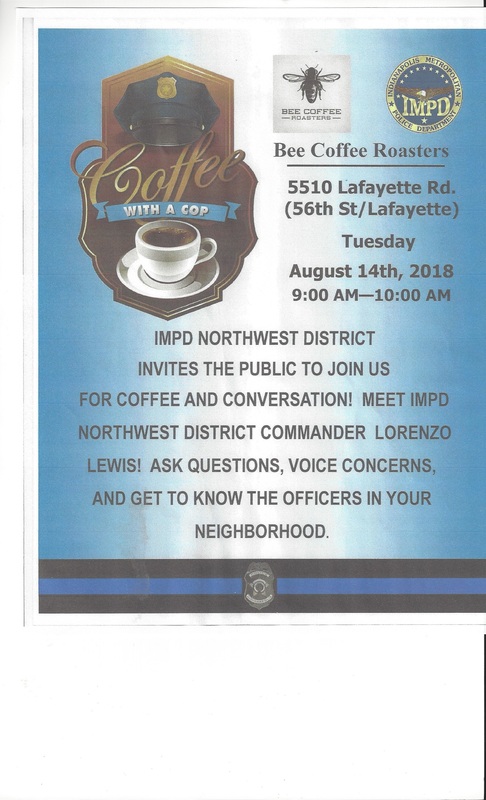 Let’s have a great turnout for this “Coffee With a Cop”! It is hard to believe that summer vacation is already over for boys and girls as most in our entire area has already started back to school. Please remember as you are driving to work, shopping, etc. to watch for school buses, students walking to and from school or riding bikes, and for increase traffic around the schools. Observe the posted speed limit signs. If you are around schools (Marion County) that have the amber flashing lights you only need to go 25 mph when they are flashing. If you are in an area that does not have the lighted amber signs you need to observe the signs that are posted. Do allow extra time to reach your destination as the speed is lower in school zones and there will be more traffic around schools. Remember, it is against the law to pass a stopped school bus with flashing red lights. Below are some safety tips I had from IMPD. Go over these with your children or grandchildren and make sure they know how to walk, ride bikes, or ride the bus as they go about their day. 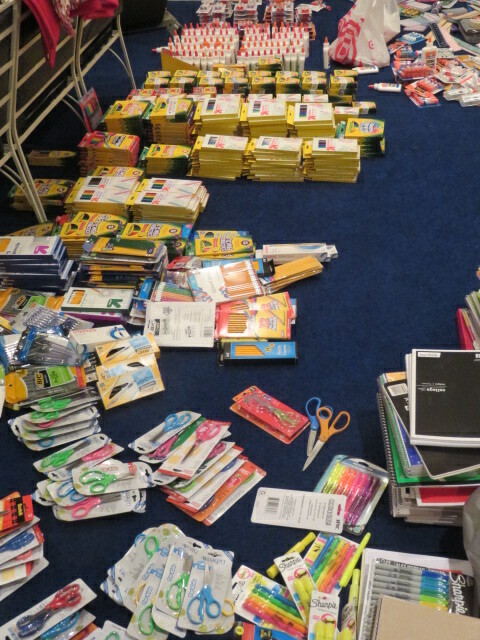 Once more I would like to thank everyone who has donated school supplies for our local schools (see picture). Earlier this week I picked up supplies again from Eagle Creek Park. I could not believe all that the 71st Street Gatehouse had (Thanks Hiking Club and others) as well as at the 56th Street Gatehouse and at the EDC. I am currently sorting out all the supplies we have so far. My husband and I will be taking them to the schools in our district and the ones that serve the children in our district starting tomorrow. Remember you may still drop off supplies at the two gatehouses or the Earth Discovery Center through August 6th. I will then make another delivery to some schools with those supplies as well. The need is always there when children move to a school after it starts and come with no supplies or as supplies get used up and need replaced. So everything that is donated will be put to good use. The students and the staff at the schools really appreciate your donations. Thanks again to everyone who has participate either in this School Supply Drive or others that your church or other organizations sponsor. As a former teacher I know how much it means.